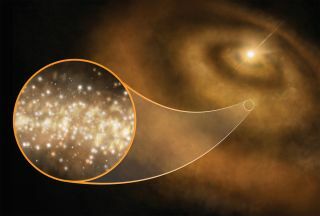 An artist's illustration of nanodiamonds (tiny nanoscale diamonds) around a young star in our Milky Way galaxy. Diamond dust is responsible for a mysterious glow emanating from certain regions of the Milky Way galaxy, a new study reports. Astronomers have long known that some type of very small, rapidly spinning particle is throwing off this faint light, which is known as anomalous microwave emission (AME). But they couldn't identify the exact culprit — until now. "This is the first clear detection of anomalous microwave emission coming from protoplanetary disks," study co-author David Frayer, an astronomer with the Green Bank Observatory, said in a statement. The study team also detected the unique infrared-light signatures of nanodiamonds — carbon crystals far smaller than a grain of sand — in these same three systems, and nowhere else. "In fact, these [signatures] are so rare, no other young stars have the confirmed infrared imprint," study lead author Jane Greaves, an astronomer at Cardiff University in Wales, said in the same statement. The researchers don't think this is a coincidence. "In a Sherlock Holmes-like method of eliminating all other causes, we can confidently say the best candidate capable of producing this microwave glow is the presence of nanodiamonds around these newly formed stars," Greaves said. One to 2 percent of the total carbon in these protoplanetary disks has been incorporated into nanodiamonds, according to the team's estimates. Another leading AME-source candidate, a family of organic molecules known as polycyclic aromatic hydrocarbons (PAHs), doesn't hold up under scrutiny, the researchers said. The infrared signature of PAHs has been identified in multiple young star systems that lack an AME glow, they noted. The new results could help astronomers better understand the universe's early days, study team members said. Scientists think the universe expanded far faster than the speed of light shortly after the Big Bang, in a brief period of "cosmic inflation." If this did indeed happen, it should have left a potentially detectable imprint — an odd polarization of the cosmic microwave background, the ancient light left over from the Big Bang. The new study provides "good news for those who study polarization of the cosmic microwave background, since the signal from spinning nanodiamonds would be weakly polarized at best," said co-author Brian Mason, an astronomer at the National Radio Astronomy Observatory in Charlottesville, Virgina. "This means that astronomers can now make better models of the foreground microwave light from our galaxy, which must be removed to study the distant afterglow of the Big Bang," Mason added. The new study was published online today (June 11) in the journal Nature Astronomy.